VISITING CANADIAN FM TELLS AUDIENCE IN HERZILYA THAT ISRAEL HAS NO BETTER FRIEND THAN IN OTTAWA…….. – The Tundra Tabloids……. 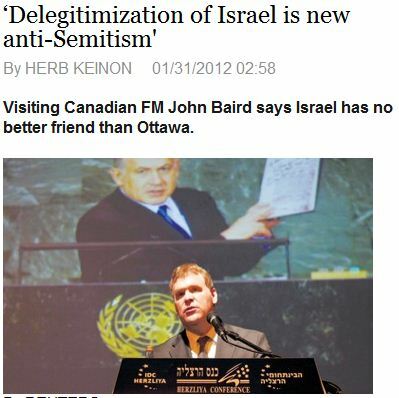 VISITING CANADIAN FM TELLS AUDIENCE IN HERZILYA THAT ISRAEL HAS NO BETTER FRIEND THAN IN OTTAWA…….. The US capital in Washington D.C. can’t say the same during the Obama administration. Singling out Israel for condemnation to the exception of real violators of human rights abuses etc., has always been an act of anti-Semitism. Turning reality one its ear, calling light ‘dark’ and vice versa, in order to demonize the Jewish state for whatever political reasons, has long been the key component in the strategy of the enemies of Israel and the United States. Kudos to the Canadians for having a government that takes a stand for truth and justice. Previous Post Previous Post OBAMA TELLS WIFE OF UNEMPLOYED HUSBAND “HE’LL SEE WHAT HE CAN DO”……..
Next Post Next Post MICHAEL COREN INTERVIEWED ON MEGYN KELLY SHOW ON CANADIAN HONOR KILLINGS…….